Beginning in the 1700’s and through the 1800’s their feathers were quite the fashion rage leading to the pursuit of these birds. By the early 1930’s this graceful bird was on the brink of extinction due to over hunting and loss of habitat. Nesting in wetlands, their preferred locations were on muskrat dens and beaver dams. With the westward expansion of the United States and the aggressive fur trading that ensued, the muskrat and beaver populations also diminished causing less nesting locations for the swans. In fact, it was commonly thought in the late 1800’s that the species was extinct but with good fortune a non-migratory grouping of swans were found in the remote mountain valleys of Montana, Idaho and Wyoming. (source: https://www.trumpeterswansociety.org/swan-information/information-overview.html) At that time only two nests were found in Yellowstone National Park. One in 1919, and the second in 1932 and less than 100 Trumpeters were documented in North America. As a result, in 1935 Red Rock Lakes National Wildlife Refuge in Montana was established to protect Trumpeter swans in their preferred habitat. Aggressive conservation then followed and has lead to the successful resurgence of the species in the Midwest area. 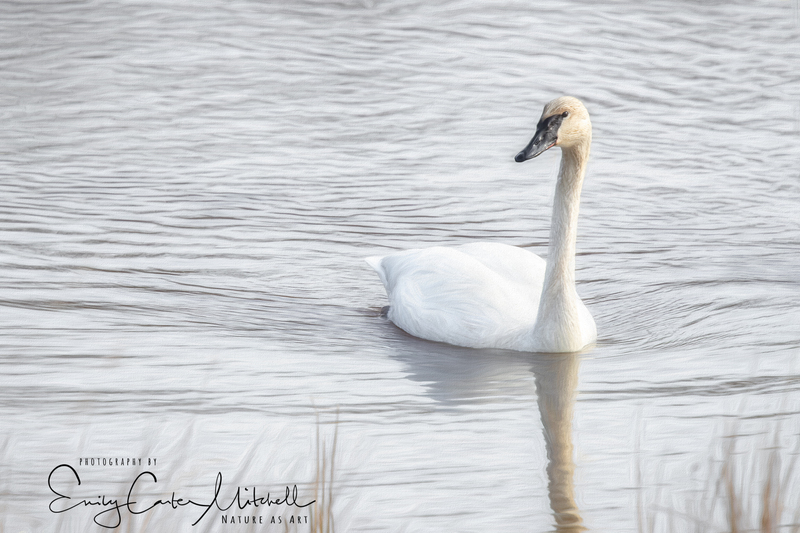 In Maryland, they are a rare species to find and I knew of one that stayed with a Tundra swan flock that migrated to the Chesapeake Bay every year. 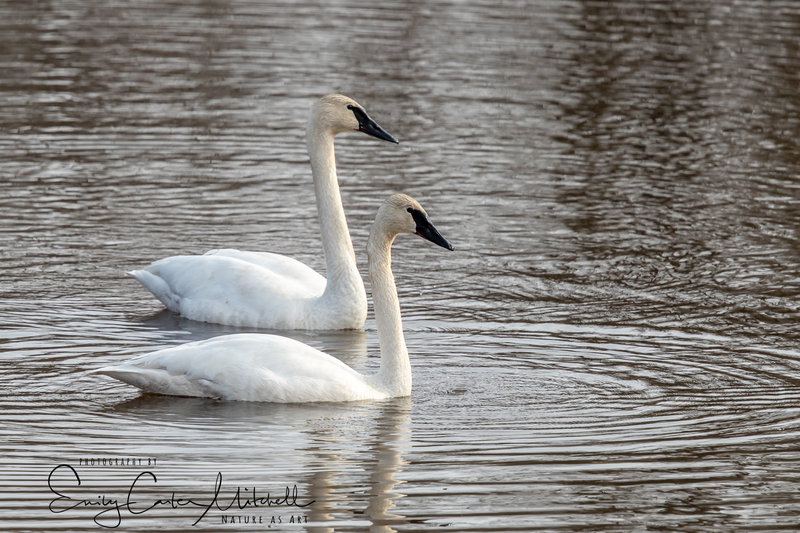 Hearing him bugle while he floated alongside his Tundra swan girlfriend we knew that he was a bit confused. And then there was another one that returns to a popular community lake in Greenbelt every winter and stays a month or so. Proudly bearing his tag he enjoys his daily human visitors. There is also another pair that I know of on private property and they enjoy it so they have moved in permanently in Davidsonville. This pair is a newly arrived pair and have been seen at the Patuxent Research Refuge. Fairly tolerant of their human visitors it’s been quite the sight to behold these majestic swans. 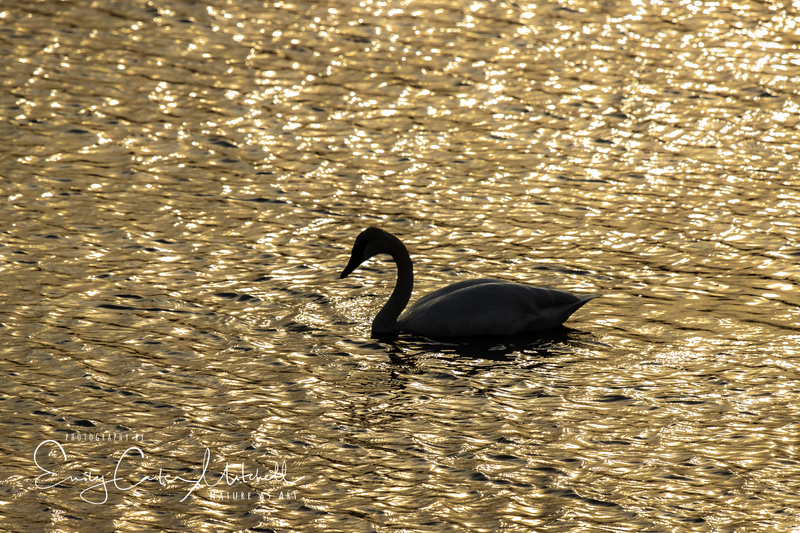 The Trumpeter Swan Society have been caring for these swans for over 50 years and offer a concerted effort for conservation, education and preservation of the swans. 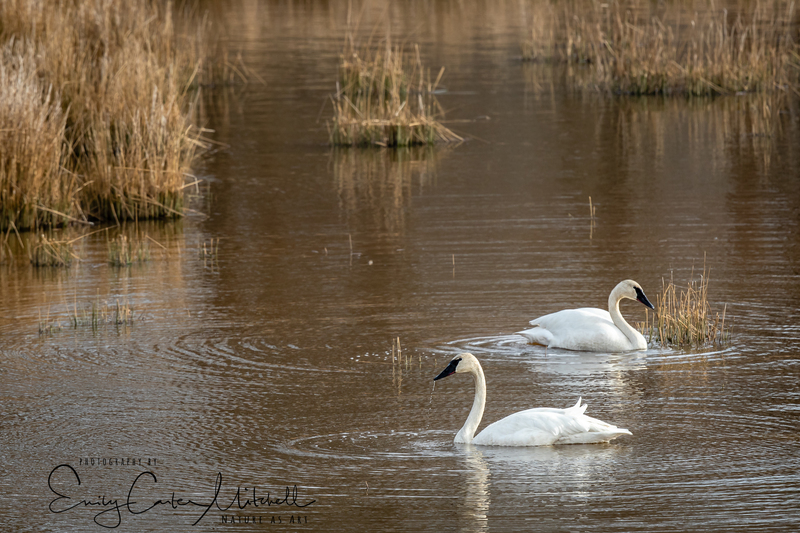 As the focus of conservation efforts have in the Mid-West region, presence of Trumpeter swans in Maryland is quite notable. These sightings could perhaps be a sign of good things to come. With Climate change there has been a shift in bird migratory and breeding patterns and the avian world can give us clues of how these changes affect nature. What are the swans I always used to see between the Bay Bridge spans on the Kent Island side when I went that way more frequently? Thank you, they truly are. I enjoyed your historical review and great photos. Thanks. It’s truly my pleasure to share these beauties. Thank you very much for your kind comment.